New and innovative technologies to aid the elderly are being adopted by medical institutions and nursing homes across the island. One is a device that serves as both umbrella and walking stick and has built-in functions such as an MP3 music player and alarm sensor. The Bond stick as it is called, was among 50 products from countries being showcased at the 9th International Ageing Asia Innovation Forum, which attracted hospital and healthcare professionals and product innovators. The two-day forum at Marina Bay Sands Convention Centre ends today. The product showcase is open to the public on Wednesday. Entry is $50 but free for those over 50. Many of the products were being launched for the first time outside of their country of origin. Senior Minister of State for Health Amy Khor said at the event: "Rethinking aged care and supporting our aged population is not a task that can be accomplished overnight. "To succeed in these efforts, the public, private and people sectors will have to work in partnership to re-imagine new possibilities and solutions." 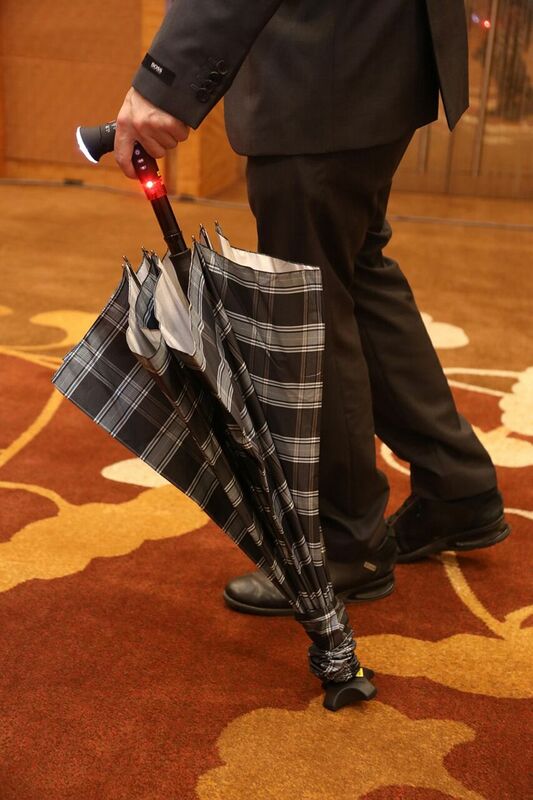 The Bond stick looks more like an umbrella and helps people who might be resistant to a walking cane due to the stigma attached to using one, said Mr Tan Lee Tuan, director of local start-up Bekind Solutions, which devised the product. An auto-fall sensor sets off a loud alarm if the user falls while holding the stick. The built-in MP3 player and radio help reduce the rate of dementia deterioration through sensory stimulation. While officially launched at the forum, the product has been available at $73.80 in public hospitals like Tan Tock Seng and Singapore General since October. Engineering manager Kit Su, 56, bought the stick for his elderly father, who requires some form of walking support. "We would always have to remind him to take his last two sticks out, but for this one, he more or less always remembers to take it around with him," said Mr Su, who added that his dad enjoys the built-in radio and MP3 music player. He also noted that although the stick is slightly heavier than normal ones, it is less bulky and stands by itself, so his 86-year-old father need not constantly find a place to rest it. Other innovations on show at the forum include the Japanese-designed Doki Doki Snake Extermination game, which is used to strengthen the leg muscles and improve reaction times. Similar to the Whac-A-Mole arcade game, snakes pop up from the game machine and users push them back in with their feet. There are plans to use it in five nursing homes and eldercare centres here. It will probably make its way to the Salvation Army next month. SmarTable is another form of fun rehabilitation. It has six games that help to improve memory, accuracy in hand movement and response times of people with cognitive impairment. The games are simple and interactive, like a memory one to find matching cards. Ms Janice Chia, founder and managing director of Ageing Asia, said: "When we look at all the services that are emerging in the market today, it is a sign of acknowledgment that the changing baby boomer wants something different. "They want to be stronger as they age, supported as they age, enabled and empowered."